I always enjoy reviewing mechanical keyboards, and I was extremely happy when Cooler Master sent me the Quickfire XT to review as I am in the process of currently changing work keyboards and am a bit undecided on what to purchase as a replacement. The Quickfire XT is the full size brother to the Quickfire Rapid, ..
Wireless gaming mice are not a new thing, and the Logitech G603 is one of a few newish releases aiming to improve the market for a quality wireless replacement in your gaming environment. As a user of a Logitech MX518 for well over 10 years (up until recently  at least) This G603 has a .. This is the first of hopefully many DavePlays.co.uk video unboxing and reviews. Today I am taking a look at a bluetooth speaker from SUN-HO Technology who are based in Taiwan. As you can see from the video it performs exceptionally well, and has many features, including: Bluetooth 4.0 connectivity up to 10M range. Play/Pause Volume ..
It’s been a long time pestering Cooler Master, but I have finally got my hands on a Nova Touch to take a look at. A different take on the mechanical keyboard trend in effect at the moment. 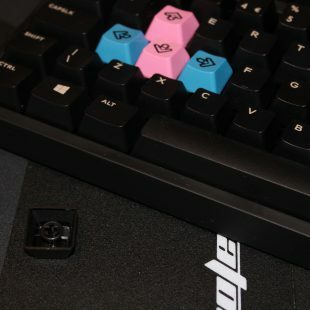 It features hybrid capacitive switches from Topre, rather than Cherry MX or other clone switches. They offer a ..